The wet conditions present in fishing requires the best tools, and that’s what Bubba Blade fishing pliers offer. These pliers are one of the best tools you should have when fishing out in the lake or on the river. Whether you are an avid angler fishing for sport or a weekend fisherman living off the water, you will find these pliers worthy subjects regarding cutting, rigging, and hook removal. Not only do they offer exceptional control and safety, but the design and material are highly durable and will stand the test of time in the unforgiving conditions of the marine environment. If you buy low-quality fishing pliers, it will be too late when you need it out on the water. As an angler, you need to cut lines, bend wires, remove hooks, and change split rings and many more, and a quality fishing plier best performs these functions. Bubba Blade fishing pliers feature a strong, extra-sharp cobalt cutter as well as a non-slip grip that reduces accidents to the barest minimum. If you love catching your own fish or can’t miss the seasonal spawning rush of America’s magnificent marine species, then you can’t do without one of Bubba Blade’s fishing pliers. The best part is that they are affordable. In this review, you will learn about these pliers and why they have won the hearts of many fishers. But first, let’s check out the qualities to check when shopping for quality fishing pliers. 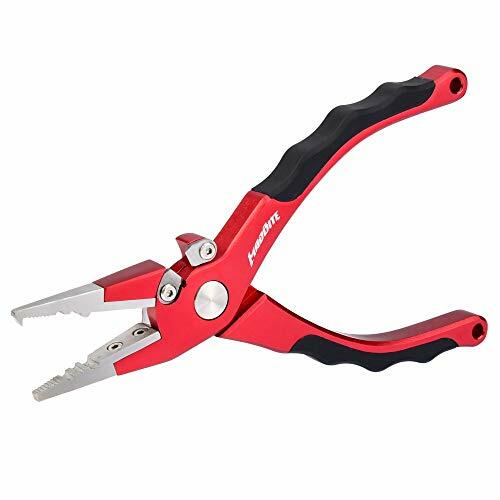 Because you will be working in wet conditions, the ideal fishing plier should be made with corrosion-resistant material like high-quality aluminum and stainless steel. It’s important to go for high-quality aluminum and stainless steel such as aircraft grade aluminum and 420HC Stainless steel respectively. Low-quality aluminum will bend under pressure, and cheap stainless steel will rust shut within a short period. It’s important that your fishing pliers feature a strong side cutter. A side cutter is a great tool for cutting off the shank of a hook when it gets lodged in your gear or after the uncomfortable situation where your angler friend unknowingly swings his hook into your arm. Remember to buy sturdy fishing pliers as low-quality brands will buckle under the high force required to cut a hook. You need a plier with sharp and hardened edges if you use a lot of braid during your fishing activities. You will want your fishing pliers to offer an excellent grip in the presence of fish slime, water, and fishing lures. Go for pliers with molded grips as they offer secure, non-slip grip when things get greasy. Depending on the fish species that you hunt, you should get a set of pliers with a nose and handle length that’s appropriate for removing hooks lodged deep in the fish. If you are dealing with saltwater fish, which generally have more teeth and larger size, you want your pliers to be longer. Pliers featuring crimping notch in the jaws come in handy when you need to make the crimped connection for heavy tackles. If you have this feature on your fishing pliers, replacing or changing a treble hook on your lure becomes a breeze. You don’t want to lose your premium fishing pliers when the waves rock your boat. With a lanyard, your fishing pliers will not be left lying on the seabed. Now that we’ve covered the features to look for in your fishing pliers let’s look at the different types of Bubba Blade fishing pliers. Bubba Blade is a popular brand among fishermen and hunters. The need for a sharp fillet knife which can hold its edge in the harsh salty condition of the ocean that won’t pit or corrode, and which is safe and secure to use in the slimy conditions that predominate when you are cutting fish on the boat brought about the Bubba Blade brand. The blade was the brainchild of fishers and was made for fishers, and it has always delivered. Featuring a signature no-slip grip and high-quality stainless steel with Rockwell hardness rating of 56-58, Bubba Blade offers exceptional edge-holding quality and resharpening abilities. These unique features have also been transferred to the company’s world-famous fishing pliers. Most anglers know that the sport is a highly technical environment, and you need simple but highly efficient gear to excel on the water. Bubba Blade fishing pliers come in a variety of shapes and sizes to satisfy the whole spectrum of functions you might need while fishing. Stainless steel jaws with titanium bond for increased strength and durability. Aircraft-grade aluminum construction for reduced weight and enhanced usability and reliability. Bubba Blade proprietary No-slip grip for safe and secure usage. Three sets of crimpers for making leader sleeves and split shots. Nylon sheath and lanyard for easy access and protection. The Bubba Blade 7.25″ fishing plier is a lightweight but highly efficient fishing plier that takes care of all your needs while fishing. Like the popular Bubba Blade, these fishing pliers feature a solid construction for enhanced strength, durability, control and will last you many years to come in the harsh conditions of the saltwater marine environment. 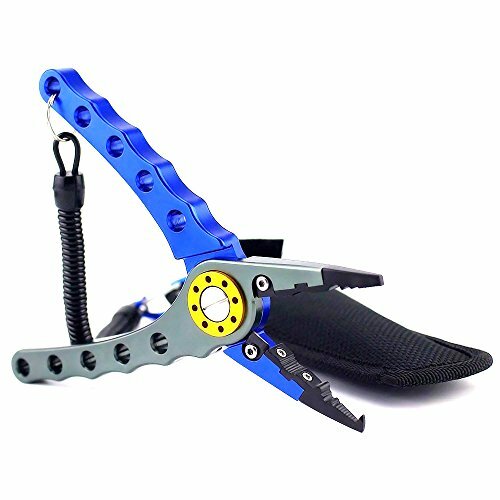 The company’s patented No-Slip Grip handle ensures you can use the fishing plier on fish or fishing activities with ease and protection from the fish while allowing you to apply maximum force on the object of interest to get the job done quickly and neatly without fear of it slipping out of your hold. 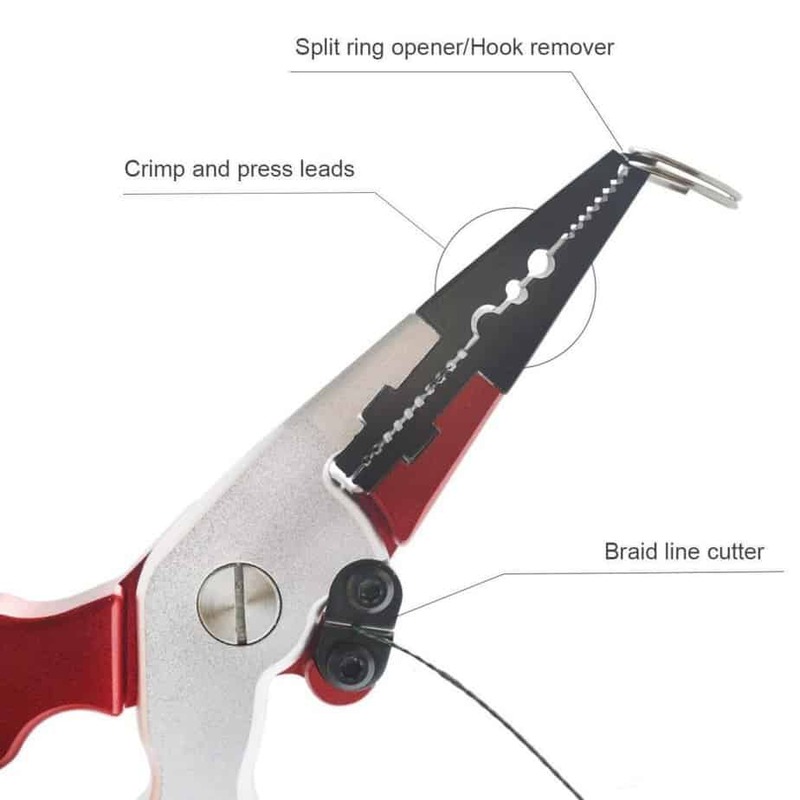 Other outstanding features of these pliers is the high tensile Cobalt cutter which is sharp enough to cut through any braid or monofilament and three sets of split shot and leader sleeve crimping cutouts which make crimping easier and faster. The jaws are titanium bonded for increased durability and strength and to ensure that the fish slid off the plier without much effort. Handling is efficient as the pliers are made from aerospace aluminum which is lightweight but won’t buckle, pit, or bend under excessive force. The icing on the cake is the lanyard and nylon sheath which helps you store it away in safety while offering greater accessibility when you need it most. From the red TRP handles, titanium-bonded jaws, Cobalt cutters, and lanyard, the Bubba Blade 7.25″ fishing pliers are made for optimal control, usability, and durability. They are the perfect size for removing a hook from medium-sized fish, and the non-slip grip won’t slip even during splashes and bloody encounters with fish. It’s that good. Also, they are great at home or in the car or anywhere you may need long nose pliers. They cut through hooks, monofilament, braid, and everything in between. However, some users have complained about it not being the strongest, but the quality is not in doubt. Ti-Nitride Bonded High Carbon Stainless Steel Jaws. If you are looking for an easy to use split ring tool, these pliers are one of the best on the market. With these pliers, you can easily open split rings, remove hooks, and replacing treble hooks on your favorite lure will be faster and neater. These pliers come with an extremely strong carbide line cutters, as well as split shot and leader sleeve crimping cutouts. In the spirit of Bubba Blade culture of excellence, these split ring fishing pliers feature the best materials on the market. The pliers feature high carbon stainless steel bonded with tri-nitride bond for increased durability and edge retention. The red handles feature Bubba Blade’s patented No-Slip Grip technology for maximum safety and control in the unstable and slick conditions of a fishing boat. These pliers have everything you need in fishing pliers and will open split rings, remove hooks and replace or change treble hooks so you can have the best time on the water. It also comes with a coiled lanyard and black nylon sheath to keep it safe and secure and easily accessible. You can’t beat the handle of these pliers as they are comfortable on the hand and offer a firm grip that makes handling large fish and treble hooks with lures easy and efficient. You never know the importance of a firm grip until you get into a slimy situation, but these pliers’ signature grips will always carry the day. These pliers will retain the sharp edge longer, resist rust and serve you for many seasons to come. Tri-Nitride Bonded High Carbon Stainless Steel Jaws. Sometimes the handle of your pliers get in the way when you need to remove hooks, but the ergonomically constructedBubba Blade Pistol Grip Pliers makes removing hooks from fish of all sizes a stress-free enterprise. Whether larger fresh fish or razor-toothed saltwater species, the off-set handles, long nose and firm pistol grip of these pliers provide increased leverage and accessibility to remove hooks with minimal effort in safety. These pistol grip fishing pliers feature super strong high carbon stainless steel jaws with a tri-nitride bond as well as carbide cutters which offer immense cutting ability. 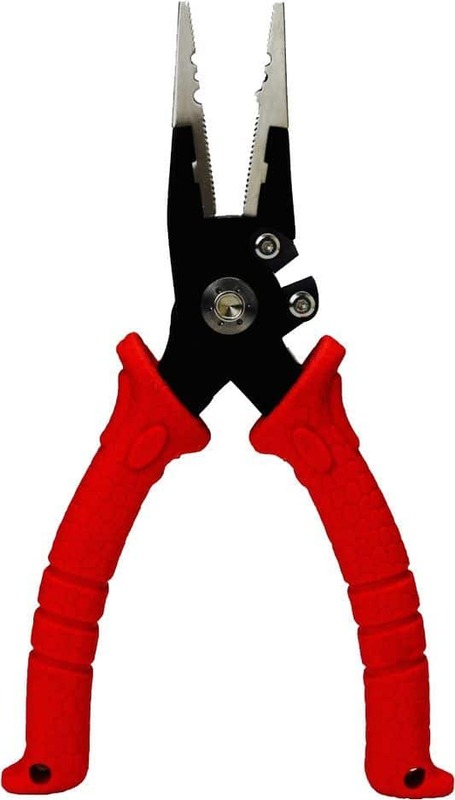 These pliers also come with crimper tool and are spring loaded for maximum cutting power with less effort. Like other fishing pliers from Bubba Blade, these pliers feature the red no-slip grip handles which are soft and comfortable to hold, yet offer a strong and firm grip that would keep the fishing pliers in your hand regardless of how slippery things become while handling large fish. For maximum control, corrosion resistance, and improved durability, these pistol grip fishing pliers will make an excellent addition to your fishing toolbox. A coiled lanyard and protective nylon sheath keep the pliers within easy reach in safety. An overall length of 10″. Like the pistol grip fishing pliers above, these pliers feature an ergonomic design that provides more access and maneuverability when you are performing the delicate task of removing hooks from larger fish. Also, these pliers offer a split ring tool which makes it easier to open split rings, change treble hooks on lures, and remove hooks. They are built with high-quality HC stainless steel tri-nitride bonded for corrosion resistance, increased cutting power and durability. They feature Carbide line cutters to cut braid and monofilament cutters and crimper tool to make hard work of fishing easier, faster and more efficient. 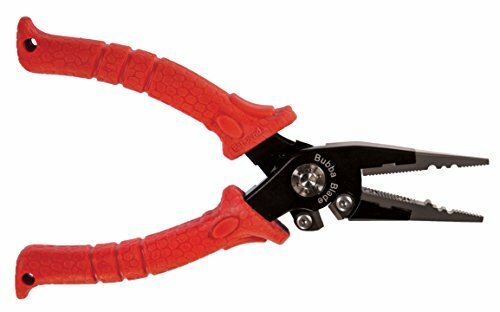 These pliers feature Bubba Blade’s patented red handle which offers a surprisingly comfortable but firm grip that allows you to tackle larger fish and extricate hooks safely, cut lines, or open split rings with increased leverage and ease of use. These pliers feature extremely strong jaws made from high carbon stainless steel. Cutters and other enhanced features. Bubba Blade fishing pliers are unarguably the preferred choice for many anglers and amateur fishers. From their ergonomic design, solid construction, highly durable materials and mind-blowing cutting power, these little tools pack an impressive punch that will make your fishing experience less stressful and more efficient. Not only are these fishing pliers great for use on the boat, but they can also come handy at home or in the vehicle when you need long nose pliers with high cutting power and ease of use. If you need pliers that are versatile, corrosion-resistant, long-lasting and durable, Bubba Blade fishing pliers foot the bill. And the best part is that buying one won’t drill a hole through your wallet. With one of these, you can rest assured of getting all your plier functions done with finesse sans injury or frustration. 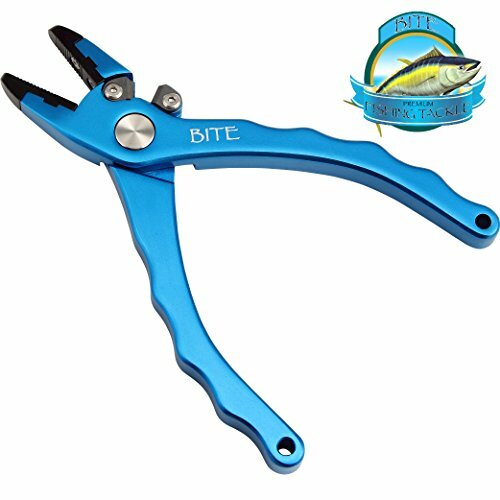 Bite Fishing Tackle pliers are a favorite of many anglers. These pliers have everything you want in fishing pliers and more. They have an exceedingly strong structure, thanks to their anodized aluminum alloy material. These pliers also feature super sharp, replaceable line cutter and side cutter, so you don’t have any problems cutting braid, monofilament or fluorocarbon lines of any grade or removing hooks from large saltwater fish. Bite Fishing pliers are spring loaded, making it easy to apply maximum pressure with minimal effort. The grip is stable and won’t slip. The material is rust-resistant and can withstand the harsh conditions of the marine environment. 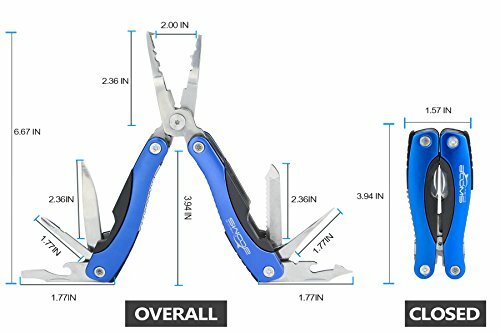 You can get these pliers in two sizes including the 7.5″ which doesn’t come with a split ring nose and the 6.5″ split ring version. Also included is a lanyard and sheath for safekeeping while rocking on the boat. With a solid grip and high-quality aluminum alloy material, these pliers will diligently serve you for ages. The Booms Fishing L1 13-IN-1 fishing pliers are an asset in your toolkit. 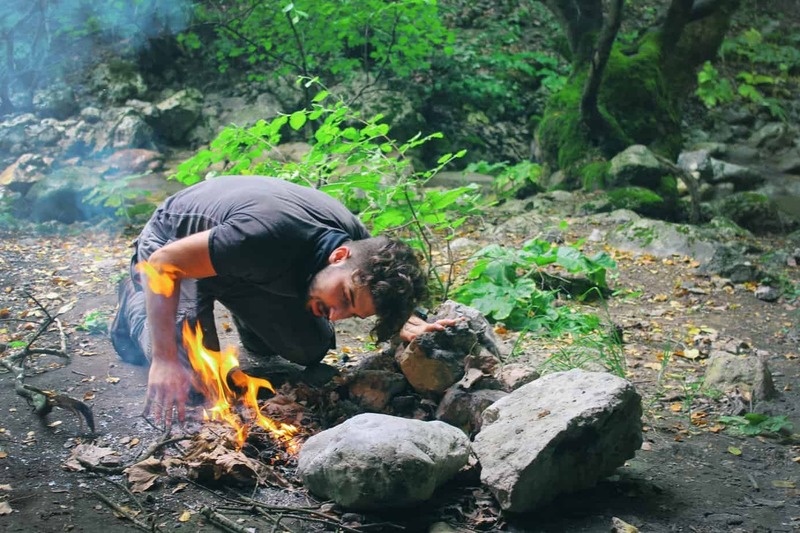 These dynamic tools are not only exceptional at getting work done on the boat, but they are also a handy gear for hunting, camping, hiking, other outdoor adventures and general use at home. These pliers are constructed from hardened stainless steel and feature a split ring nose, making them ideal for split ring hook assembly, crimping, and gripping. Included in the pliers is a knife, line cutters, can opener, Phillips screwdriver, flat screwdriver, bit driver, awl, bottle opener, hard wire cutter, saw, and a 3-side file. All these add-ons fold into the hardened plastic handles of the pliers to make them compact and portable and to protect the metals from corrosion. You can get the pliers in a variety of colors including blue, black, and silver. They also come with a coiled lanyard and a nylon sheath with a belt loop clap. Piscifun Aluminum fishing pliers are offered in two versions including the saltwater fishing pliers which is 7 7/4″ long and the split ring nose pliers which has a length of 6 2/3″. The pliers are made from high-quality corrosion resistant aircraft-grade stainless steel coated with titanium for increased strength and durability. The ends of the pliers are serrated and the handles perforated to reduce weight, increase control, provide a firm grip and prevent slippage. Its spring loaded and can be used with minimal force with one hand. You will also notice that the saltwater versions are long-nosed and heavier than the shorter and stub-nosed Split Ring version. The split ring version features a hook which makes split ring hook assembly easy and efficient. Both pliers have replaceable tungsten carbide cutters which makes them excellent for cutting any line as well as crimping slots. You can get them in a variety of colors including blue, red, gold, purple, and silver. 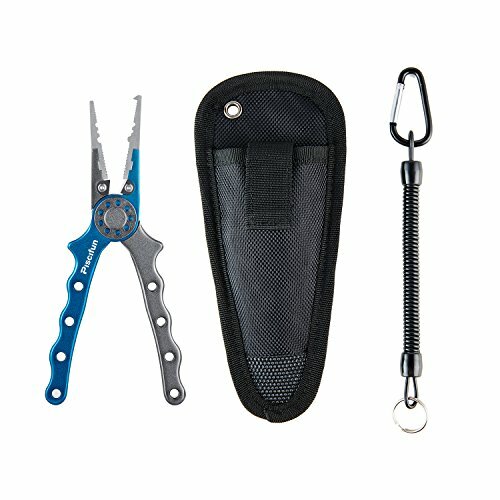 Like most fishing plier brands, they also come with a nylon sheath, a tether, and a belt loop clasp. These pliers are extremely strong and have a long useful shelf life because they are corrosion resistant. And they are also very affordable. The Madbite plier comes with some innovative features you won’t see in most pliers on the market. The most distinguishing feature of this plier is a LED bulb that turns on with a twist. This unique feature will be of great benefit for people who love fishing at night. Like any fishing plier worth its salt, the Madbite is made from hard anodized aluminum and stainless-steel components which are corrosion resistant in salt water. Other enhanced features on the Madbite include sharpened tungsten carbide cutters for cutting through braided, monofilament or fly lines and a split-ring tool. A firm grip is achieved with a non-slip silicone grip handle, making it safe to use even while working in slimy and bloody conditions. 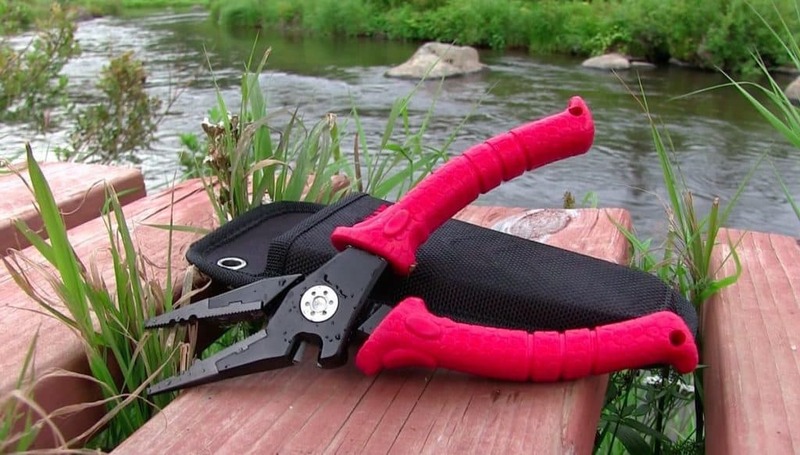 These pliers are excellent tools to have when fishing on the bank, in the surf, or your kayak. The Zitrade aluminum fishing pliers are a fantastic tool to have when you go fishing. 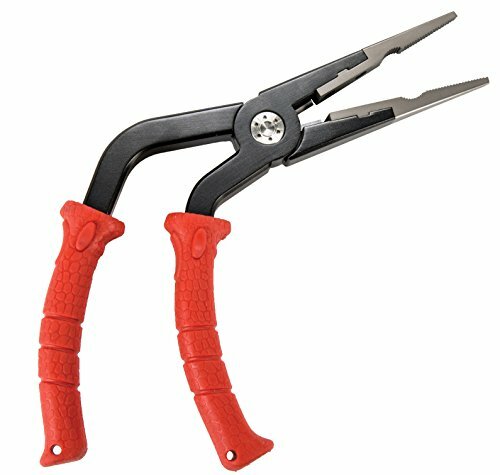 The pliers feature a durable aluminum gripper and stainless-steel jaws that are saltwater corrosion resistant. The cutters come with precision sharpened tungsten carbide for effortlessly cutting through any line. 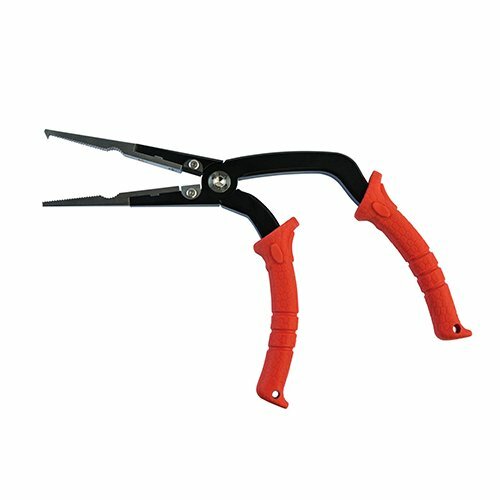 The pliers are great for line cutting, removing hooks, stripping, pulling, and crimping. 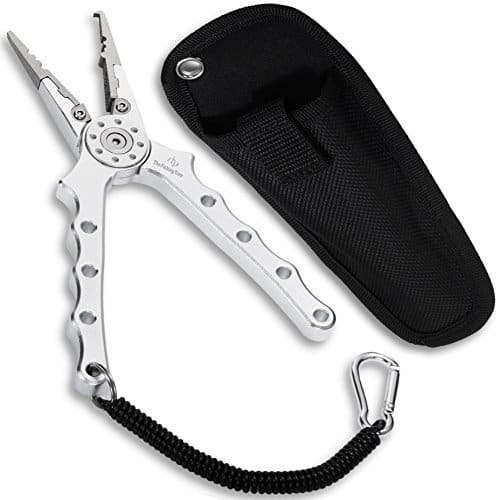 Zitrade pliers are portable and lightweight and come with a coiled lanyard and a pouch for easy transportation. The only downside to these pliers is that it can get slippery when wet. But it’s a solid product worth its price any day. The Fishing Tree pliers are one of the lightest fishing pliers on the market. It features a compact hinge, perforated handles, and several other design characteristics geared towards weight reduction. Weight reduction makes it easier to control and increases usability. Constructed from corrosion-resistant aluminum and stainless-steel jaws, Fishing Tree pliers also come with sharpened tungsten carbide line cutters which you can replace when the old one becomes worn out. It can be used for cutting every type of line, removing hooks, crimping, and split ring assembly. These pliers will make a great addition to any angler’s toolkit. Its compact, lightweight, and comes with sheath and lanyard for easy transportation. One great thing about these pliers is the Lifetime Guarantee offered by the producer. It’s safe and can also be used at home. It’s a versatile piece of hardware. The most important qualities to look for in your fishing pliers is for it to be made from a material that is strong and corrosion resistant, have the appropriate nose length and come with sharp and replaceable line and side cutters. We have seen fishing pliers with several add-ons, and some come with LED lights to make night fishing easier. Be sure to go for pliers with excellent grip handles as you will need it when things get sloppy on the boat. It’s also great to have a split ring and crimping capability in your fishing pliers to make them genuinely versatile and efficient. Regardless of their size or shape, fishing pliers are an unsung hero in an angler’s toolkit. If you forget to bring one along, fishing can become dangerous and difficult. And that’s when most fishers realize how vital a plier is to angling. Whether you love the simple looking or the elaborate, a great fishing plier will remove hooks, cut lines, split rings, and crimp without any fuss.